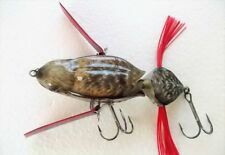 This “Bug” lure will induce bites with its silhouette and pulsation affect. The most important factor for the “Bug” lure is the “sound” the bug makes when falling on the surface of the water. The hard body of the Shinmushi will enable any angler to create this effect. Arbogast Jitterbug. Weight: 3/8 oz. Color: Black. MPN: G600-02. Treble Hooks: No. 5. Model : Realis Popper 64. Maker : Duo. Type : Floating. Length : 64 mm. Siglett is a winged bug-bait modeled after a Japanese cicada. Its tungsten alloy balancer inside its chamber is sound-tuned to mimic the Higurashi cicada of Japan. Since line eye is located at its tail, Siglett casts with the least air resistance, insuring surprisingly good casting distance and accuracy as a winged bug bait. This fishing lure is designed like a real locust insect to attract fish and bring you much fun. A wonderful lure for anglers! 6 Cricket Lure. Weight: 3g / 0.1oz. Length: 4cm / 1.6in. Diving depth: 0-0.5m / 0-19.7in. Jackall Noisy Top Water BAKUON POMPADOUR NAMAZU (CATFISH) CUSTOM # Seven Stars Color. Condition: NEW. << NOTES >>.